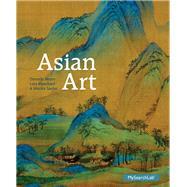 Asian Art provides students with an accessible introduction to the history of Asian Art. Students will gain an understanding of the emergence and evolution of Asian art in all its diversity. Using a range of analytical skills, readers will learn to recognize patterns of continuity and change between the arts and cultures of various regions comprising Asia. Images set within their broader cultural and religious backgrounds provides students with important contextual information to understand and decode artworks. MySearchLab is a part of the Neave / Blanchard / Sardar program. Research and writing tools, including access to academic journals, help students explore Asian Art in even greater depth. To provide students with flexibility, students can download the eText to a tablet using the free Pearson eText app. Dorinda Neave is a senior lecturer in Art History at Capilano University, North Vancouver, Canada. Dorinda received a B.A. from Manchester University U.K. and a post-graduate certificate in Education from Keele University, U.K. before completing an M.A at the University of Victoria, Canada. She currently teaches courses in visual culture and Asian art at Capilano University. Her research interests include contemporary Japanese performance art and women in Japanese art as artists, patrons and subjects. Neave’s articles have been published in a variety of journals such as Art Journal and Woman’s Art Journal. She has traveled widely throughout Japan and in 2009 was a summer visiting scholar at Nichibunken (International Research Centre for Japanese Studies) in Kyoto. Lara C. W. Blanchard is Luce Associate Professor of East Asian Art at Hobart and William Smith Colleges, Geneva, New York, where she teaches courses in art history, Asian studies, and women’s studies. She received a B.A. from the College of William & Mary and an M.A. and Ph.D. from the University of Michigan at Ann Arbor. Her research interests focus on Chinese pictorial arts, especially of the Song through Ming dynasties (960-1644) and the contemporary era, and include women as artists and patrons, the construction of gender, text-image relationships, and theories of representation. Her articles have appeared in journals such as Ars Orientalis and Nan Nü: Men, Women and Gender in China. She has traveled throughout mainland China and studied Chinese art, language, and calligraphy in Taipei. Marika Sardar is Associate Curator of Southern Asian and Islamic Art at The San Diego Museum of Art. Marika studied at the Institute of Fine Arts, NYU where she completed a doctoral dissertation on the architecture of Golconda, a fortified city in the Deccan, India. She has also worked in the Department of Islamic Art at the Metropolitan Museum of Art, New York, and her research has embraced architecture, archaeology, painting, textiles, and trade. Publications include essays in several books about the Deccan and in the catalogue The Interwoven Globe: Worldwide Textile Trade, 1500–1800 (2013). She was co-editor of Sultans of the South: Arts of India’s Deccan Courts, 1323-1687 (2011).